When you're looking to clean marble without the help of a marble restoration company, it's important to get one important fact out of the way. Marble is not granite and vice versa. Often the two are confused and considered to be one in the same, and since this happens often, homeowners make the mistake of cleaning the two stones with the same products. This can often results in damaging the stone or scuffing it in a way that may cause it to lose it's natural shine. Using vinegar on your marble can cause serious issues. While vinegar is a great cleanser for most surfaces around the house, stay away from using it on marble surfaces and floor. 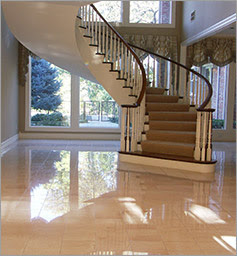 For larger surfaces, consider an expert marble restoration company. The best way to clean marble counters and floors is with a soft rag and some warm water. Use this method as your daily cleaning method and you'll ensure a nice healthy look to your marble for years. When cleaning marble floors, stick to non harsh methods like soft microfiber materials. Combine with hot water if you have some scuffs or marks on the floor. When you've completed your daily cleaning of your marble, it's time to get it polished. For small areas, like a countertop or small floor area, simply buff with a chamois in small circles. This is a relatively simple way to create a nice shine on your surface. However, for larger areas and floors throughout your home, it's best to call an expert marble polishing company or marble restoration company. These companies are outfitted with the tools and products that will give your home floor an impecable shine.